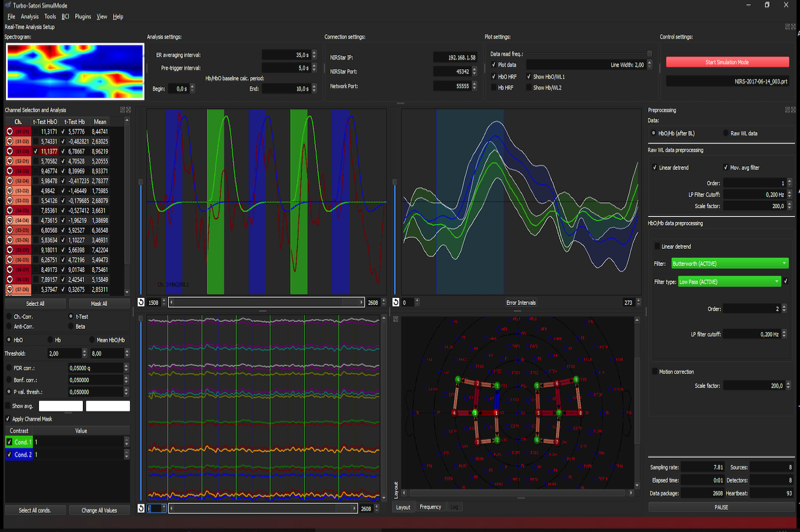 Turbo-Satori is a real-time analysis program for functional near-infrared spectroscopy (fNIRS). It incorporates multiple pipelines from real-time preprocessing and analysis to neurofeedback and Brain Computer Interface (BCI) applications. The toolbox is designed with a focus in usability, enabling a fast setup and execution of real-time experiments. Turbo-Satori uses an incremental recursive least-squares procedure for real-time general linear model calculation (rlsGLM) and support vector machine (SVM) classifiers for advanced BCI applications. It communicates directly with common NIRx fNIRS hardware and was tested extensively ensuring that the calculations can be performed in real-time without a significant change in calculation times for all sampling intervals during ongoing experiments of up to six hours of recording (depending on the amount of sources and detectors and available working memory). Enabling immediate access to advanced processing features allows the use of this toolbox also for students and non-experts in the field of fNIRS data acquisition and processing. Flexible network interfaces allow 3rd party stimulus applications to access the processed data and calculated statistics in real-time so that this information can be easily incorporated in neurofeedback or BCI presentations. Please check the release notes in main program to get more details about new program features, enhancements and fixes. Lührs, M. and Goebel, R. (2018) ‘Turbo-Satori: a neurofeedback and brain–computer interface toolbox for real-time functional near-infrared spectroscopy’, Neurophotonics, 4(4), p. 1. doi: 10.1117/1.NPh.4.4.041504.